How Prevalent are Ankle Sprains? How Do Ankle Sprains Occur? 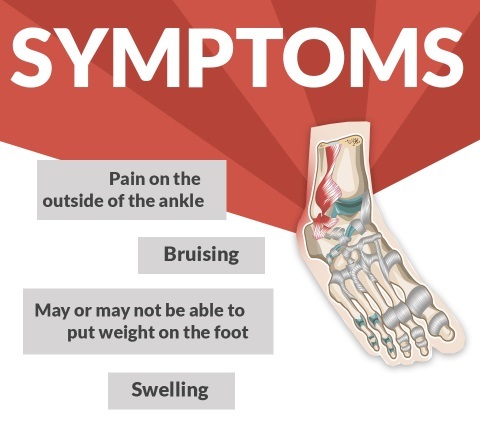 An ankle sprain does not affect your bones-which are usually untouched unless there's a break or fracture-but the ligaments of the ankle that connect the bones together. Surrounding these bones are a number of tendons and ligaments. Tendons are cords of strong tissue that connect muscles to bones, and several muscles control the motion of the ankle through them. Each muscle has a tendon connecting it to one or more bones of the foot. Ligaments are flexible bands of tissue that connect one bone to another. They bind joints together and provide stability by limiting side-to-side movement and protect joints from abnormal movements. Ligaments are elastic structures, meaning they can stretch within their limits and then return to their normal position, but when they stretch beyond their normal range, damage can occur. Since the ankle is made up of a number of bones, it contains numerous ligaments needed to hold it together. An ankle sprain is due to any force that causes one or more ligaments of the ankle to stretch too far, which can result in a tear. Depending on the type of incident and the amount of force applied, ankle sprains can range from mild to severe. To make it easier to determine how serious a sprain is, a classification system of three different grades, or degrees, is used. By knowing the signs and symptoms of each of these degrees, you'll be better able to decide what treatment is necessary and if you need to see a doctor. 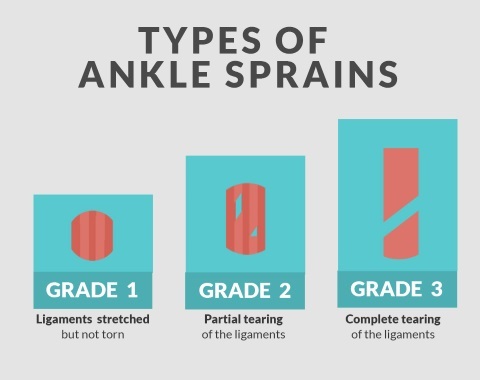 Learn more about the degrees of ankle sprains. The prognosis for the majority of ankle sprains is quite good. The exact recovery time will depend on the severity of the sprain, but most will only need a period of 4-6 weeks protection to heal properly. With the right treatment, most people are able to eventually return to their normal lives, sports and activities without any major complications. Even a 3rd degree sprain with a complete ligament tear doesn't require surgery and can heal-albeit with some additional time than a 1st or 2nd degree sprain-if it's cared for properly. Physical therapy is considered an essential component of treatment for ankle sprains that will drastically facilitate your recovery process. The overall goal of physical therapy is to reduce your pain and swelling, improve your stability and proprioception (your perception of how your body moves), and return you to your previous level of activity before the sprain. Physical therapy is also effective for keeping your ankle healed and preventing more injuries in the future. The RICE method and physical therapy are both effective approaches that will be sure to improve your condition, but a comprehensive treatment program is not complete without the addition of an ankle brace. RICE and physical therapy will reduce inflammation and get you to move your ankle more easily, but they fail to provide protection and stability. That's where these ankle devices come in. Ankle braces and supports are needed to protect the ligaments in your ankle as they heal and prevent further damage from occurring. These devices are especially important for active athletes who are attempting to slowly return to their sport, as additional stability is needed to keep their ankles safe while participating in difficult movements. We offer a wide range of braces for every step of the recovery process that will help treat and protect your ankle sprain, no matter how severe, and get you back to doing what you love in no time. Most of these braces, as well as many of our other featured products, also treat a condition known as chronic ankle instability and help prevent future ankle injuries. Need help? Use this guide on choosing an ankle brace for recommendations. Click here for detailed descriptions on our entire line of ankle braces and supports. Though the outcome for most ankle sprains is good if proper treatment is given and instructions are followed, there is one unfortunate catch: having just one ankle sprain will make you at least twice as likely to experience another one within the next year. Additional ankle sprains can happen in any number of ways like the first one, but they usually result from returning to sports too soon. In these cases, the ligaments are not given enough time to heal or the ankle may not have yet returned to full strength, and a sprain can be experienced once again. Braces provide the ankle with the stability, support and protection needed for getting around in everyday life and most importantly, during athletic performance, when the ankle is most vulnerable. Our braces are regularly tested and have been supported by numerous research studies in their ability to decrease the risk of future ankle sprains both for those with CAI and those who may go on to develop it. If you're concerned with your ankle's future and fear that you may fall into the trap of CAI and long-term disability, look no further. The line of braces we offer are the most simple, affordable and effective way you can get back to participating in the sports or activities you love without having to worry about experiencing another sprain. Best of all, our braces are designed for comfort, meaning they'll do their job of keeping your ankle protected but won't feel bulky or get in the way of your performance. For a complete list of our braces, click here.